This weekend was a blast! Friday night my friend Erin and I headed up to Granlibakken Conference Center & Lodge for Women's Wellness Weekend. 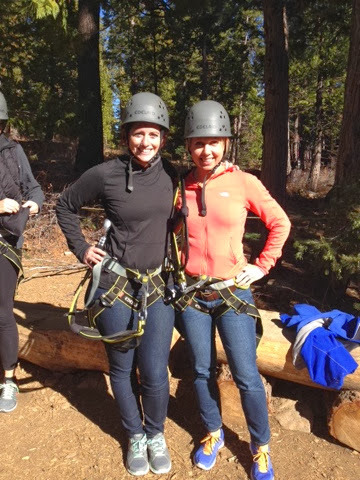 Besides learning about fueling our body and keeping our skin healthy we climbed and zipped through the trees! Granlibakken is home to the first Aerial Adventure Park in California. The Treetop Adventure Park is comprised of a series and variety of courses linking tree platform to tree platform with a number of bridges and zip lines anywhere from 15 to 50 feet in the air! We laughed and cheered each other on the entire time. 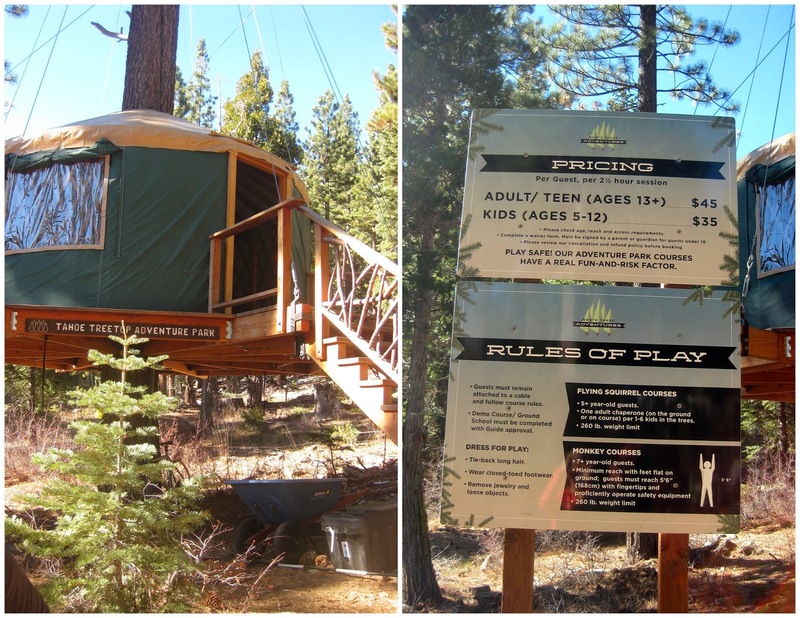 Our adventure was schedule for 1 p.m. and upon arrival we quickly made our way to the yurt to check in and sign waivers. There are two different zones of courses to enjoy, Monkey or Flying Squirrel. The Flying Squirrel zone consists of three difference courses for beginners and younger kids. While the Monkey zone offers five courses for all abilities (Older Kids, Adult Beginner, Intermediate & Advanced Zone). Once we were outfitted with a harness and helmet we headed to ground school. Safety first! At ground school a guide taught adventure seekers the how to's. There was even a mini zip-line to test our skills. Each course is rated by difficultly from green to black -- like skiing. The Monkey zone has one green, three blue and one black course. Some obstacles were harder than others. We conquered all five courses in the Monkey zone. It took us about two hours and 15 minutes to complete them. The best part was zipping through the forest after challenging your mind and body. I had to talk myself across some of the obstacles. Like these rings -- they weren't my favorite. This is a must while in Tahoe and it's not just for kids. I can't thank Granlibakken or the Treetop Adventure Park enough for hosting us. Reservations are a must and spots go quickly. The park is open year round weather permitting. Tips: I wore sunglasses, but didn't really need them. It's a pretty shaded area so depending on the time of year you'll want to wear pants and a fleece.